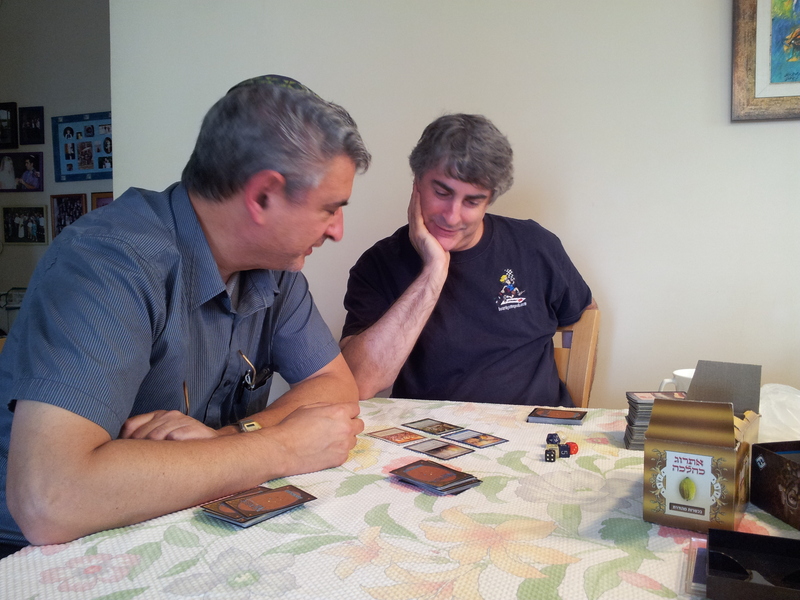 David: At the beginning of the second game I had out 3 powerful creatures (a flyer, a pumper (1B->+1/+1) and (I think) a tapper (1W->tap target creature). Jon had a do nothing 2/3 creature. He then played an inexpensive red card that does two damage to all creatures! Killed all 3 of mine, and left his own intact. Beautiful move, but very painful from my end. Jon: The end of the first game I was similarly lucky. He had me down to 4 points while he was at 11. I had two ground creatures and two 3/3 fliers and he had no flying defence so I could do 6 points before he crushed me . And my mana was low at 5 lands, only one green. I topdecked a card that gave all of my cretaures +3/+3 but I needed 7 Mana to cast with 2 green. But it was a card that let you tap creatures to reduce the cost by 1 Mana each of the creature’s color I tapped both of my ground creatures, which were green, and all of my land to cast the spell, and my two fliers we’re then able to do 6 points each. David: And one of the two creatures was a 1 casting cost white OR green for a 2/1 creature! We played while waiting for more players. Jon and I had good cards and made Grand Tichus. David missed a Tichu when Jon had a bomb. I played wrong at the end of a Tichu, fortunately it didn’t matter. First play for all but Gili. First play for Lorenzo and Martin, they liked it. Lorenzo had a lot of points, but not evenly spread which you need. We stopped after buying plants in Step 3. I realized David could probably build to 17, and I knew I couldn’t, so I asked him if he could, and we stopped, I couldn’t build to 16. He could power 16, good job. 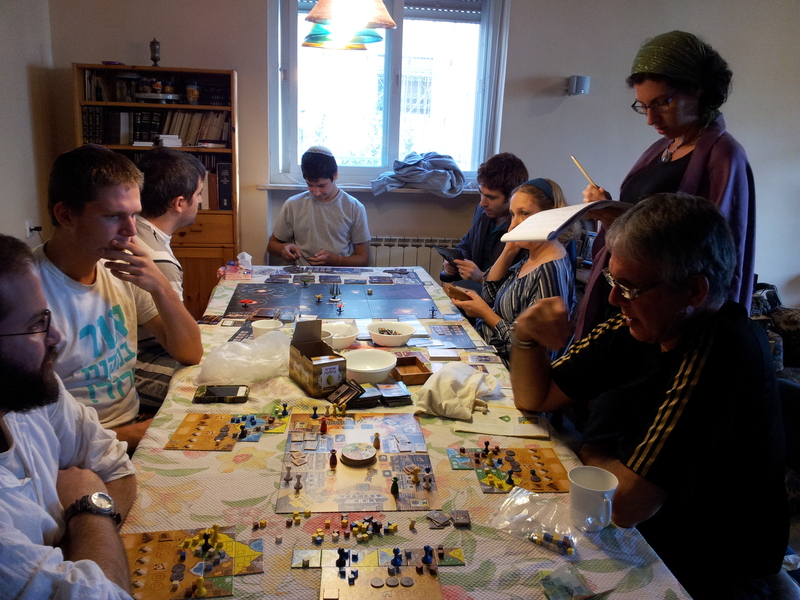 We played on the Poland board, first time for all of us. We used the middle 3 regions. Martin came over to see and liked the map, he’s from Czech Republic. Thank you to everyone who came, and brought snacks, and helped set-up and clean up. Special thanks to Jon for doing the food order, and Jon and Aaron for picking up the food from Black in town, and Aaron for taking some of the pictures. 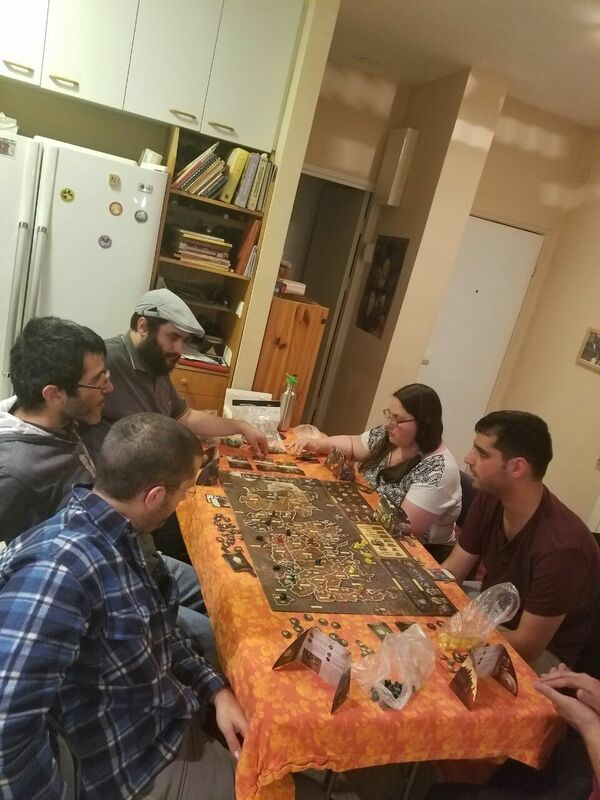 Special welcome – Emily and Eitan, our stalwart gamers who rarely make it nowadays because they’re raising their own game group. We didn’t officially keep score. Avi and I did pretty well, though Ben said that’s only if you don’t count two missed slams. Jon and Ben managed to have several hands each with less than 6 points. Ben also played this earlier with another group. 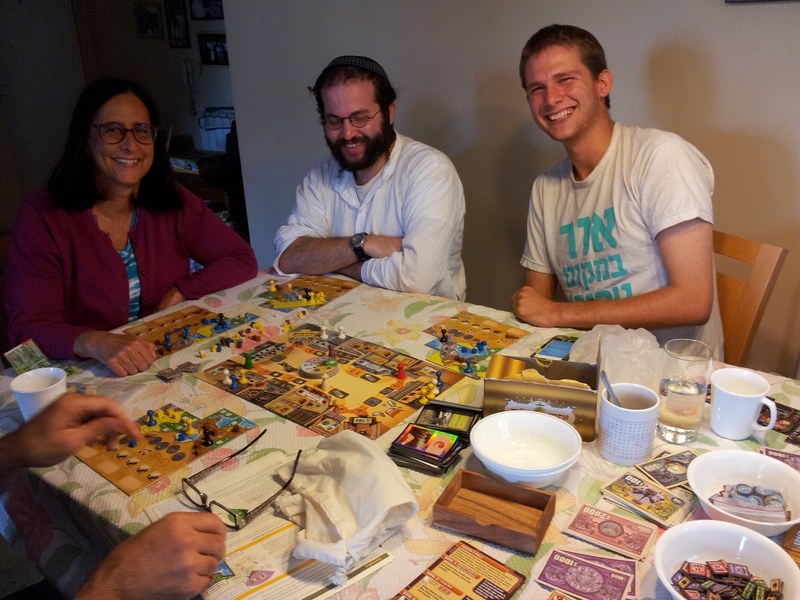 New to Shira, Haim and Avi, I explained the game to Shira and Haim while Jon and Aaron were picking up the food order, then Jon taught the game after Avi joined. Jon: The game’s mechanics work okay but they feel disconnected and awkward. Okay to play, but need polishing. Really too much luck. Have to implement some other of my changes. They stopped after about 7 rounds of 10, a super long game. 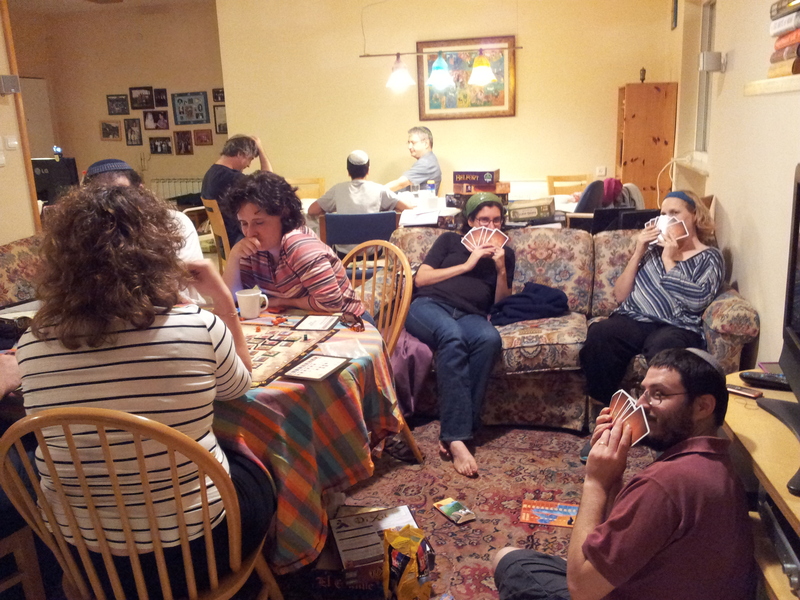 We stopped after two rounds to play other games because a lot of people arrived. We did not score tribes or Gili’s Ark, Jon had by far the most in tribes. Avi lost the first four on the first or second round, due mainly to luck that he couldn’t do anything about. My forces were a litter stronger, so as our decks were dwindling, I decided to attack with everything, leaving a few behind as defense. David and I were being hurried by you to rejoin Tichu, and he didn’t feel like calculating out how to defend against me, so we both agreed to just abandon the game. So I didn’t actually win. The game needs more players. David, very unusually, didn’t do well. As usual, I started off well then blew it. I got the 50 Power Plant relatively early on, but had no spots where I could build during Step Two, and by Step Three, Ben was too far ahead with cities and plants. He and Jon agreed to tie rather than going for another round, Jon had slightly more money. Jon: Same idea here as in Magic. 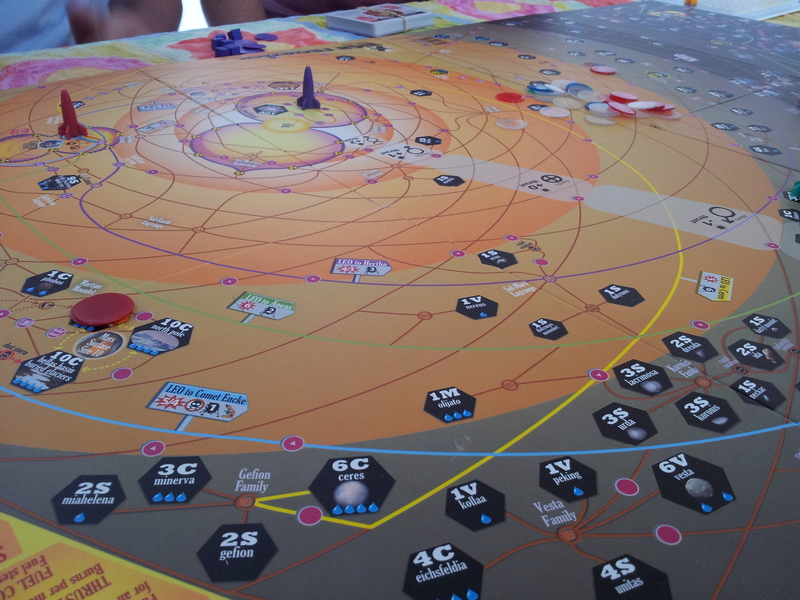 We got to the end game, and didn’t feel like slogging through one more round to see who would win. 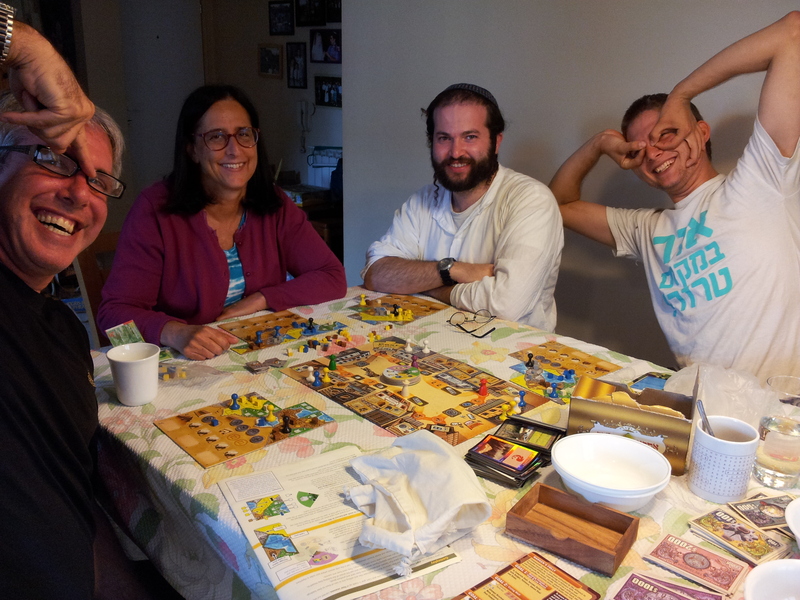 David did poorly because we played on the Benelux board, first time for all of us, and he misjudged the value of an early 4 power green plant. 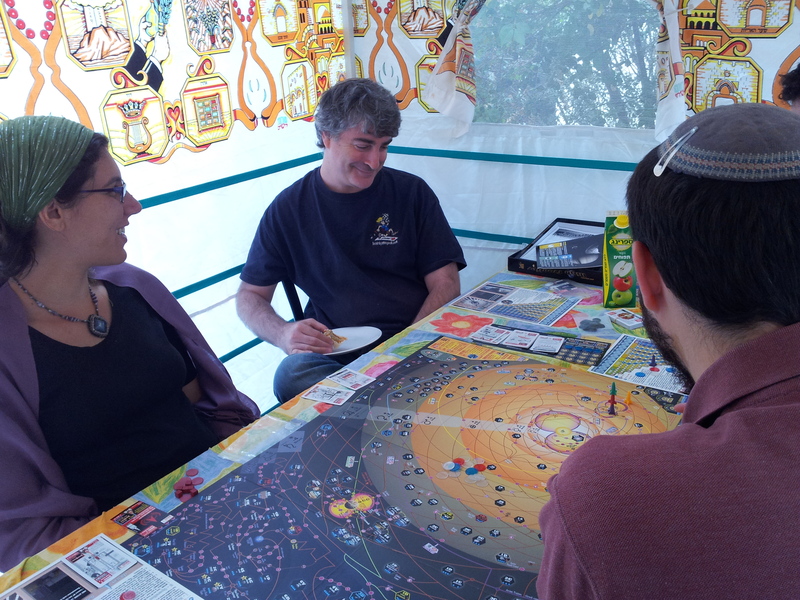 David B gave a thorough and detailed explanation to Sara, including strategic analysis, to teach her the game. 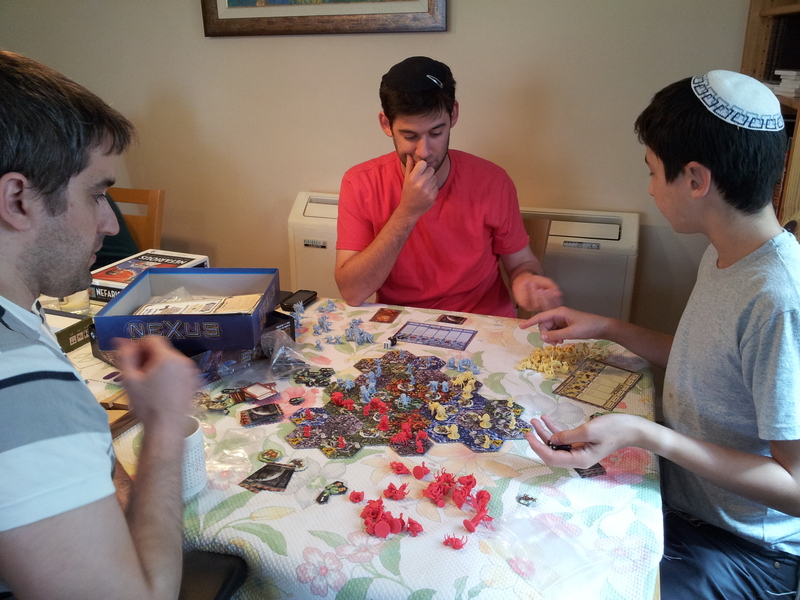 David and Yosef spent time during the game analyzing their best moves, many to block me, then selected the role Jon knew all along they would take. 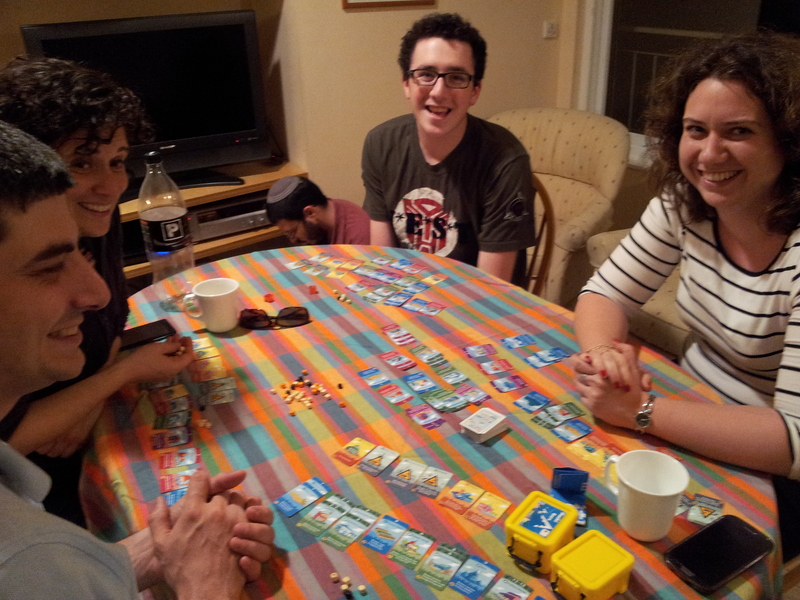 Yosef was first, he started with Prospector which is unusual in our group, though we also rarely play 5-player. He said it was to stop Jon from being able to build Tobacco on the first round, but Jon said that doesn’t matter since it would ship. Another game where I started off well, but didn’t play well enough afterwards. Though I don’t think I could have beaten all those experts. Jon: You definitely had a strong initial advantage, but twice you didn’t craft when you should have; once you took captain and once you took something else. As a result, the timing and your money didn’t quite work out. Also, Yosef got to five good with Factory, and so could take the two big buildings ahead of you. And the fact that he had tobacco ahead of me gave him reasonable early trading and late shipping. Sara had a coffee monopoly for a while, so she also did okay, but no buildings to speak of. I had tobacco following Yosef, which hurt, but I had a harbor which helped. An early filler, we played with random number order. 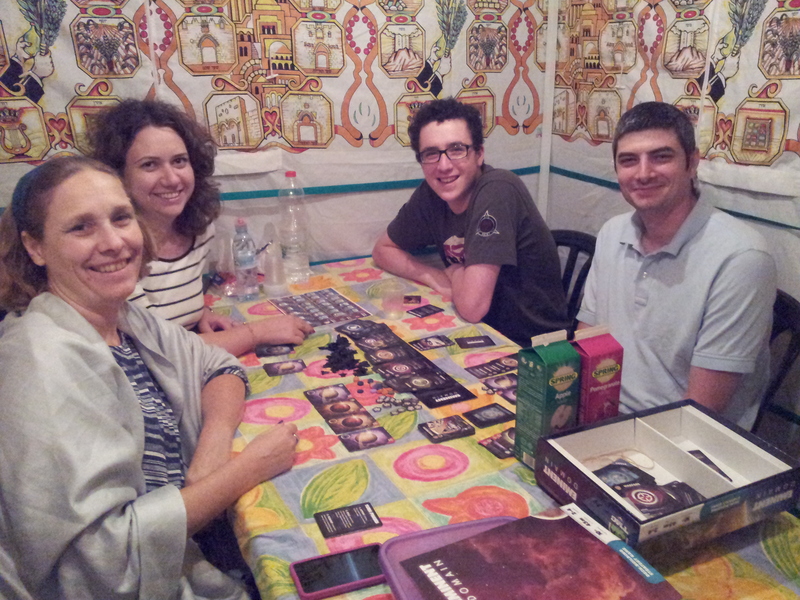 Eszter and others played a game later. Per Cliff: VICTORY WAS OURS!! The boys enjoyed it but thought it was too easy. Per Cliff: Assaf won a close victory. 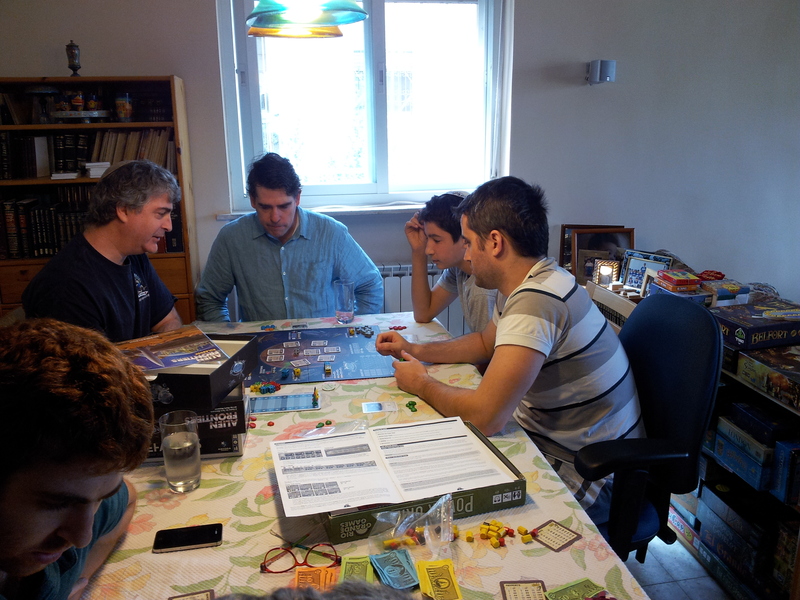 We all enjoyed the game but definitely needs some replay to really learn the strategies. Jon: I didn’t get to play this enough. 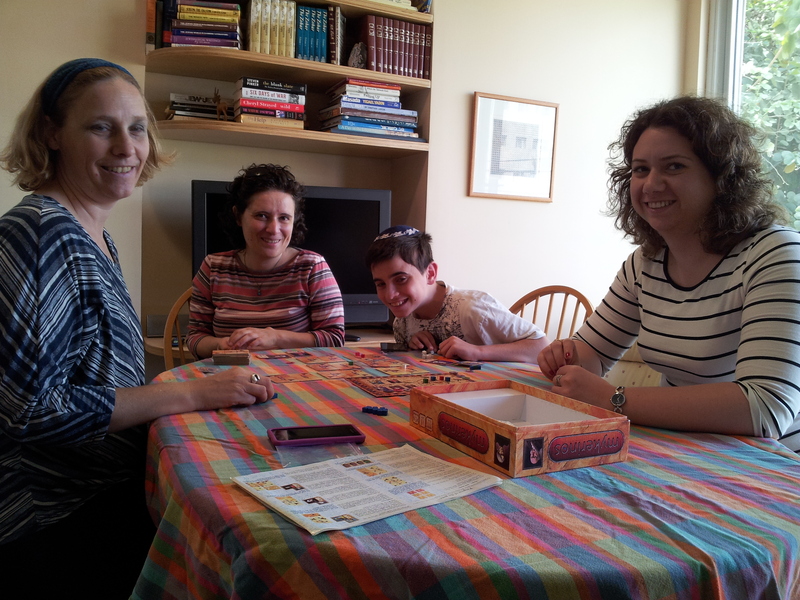 Taught by Nadine, David and Eszter hadn’t played in a long time, new to Aaron. David took a lot of workers early, Aaron had two extra storage areas and two bonuses for goods in storage, and 8 goods left, nice job. I didn’t do well with my board, and didn’t take another worker til late. Eszter took an extra storage right away which helped her. 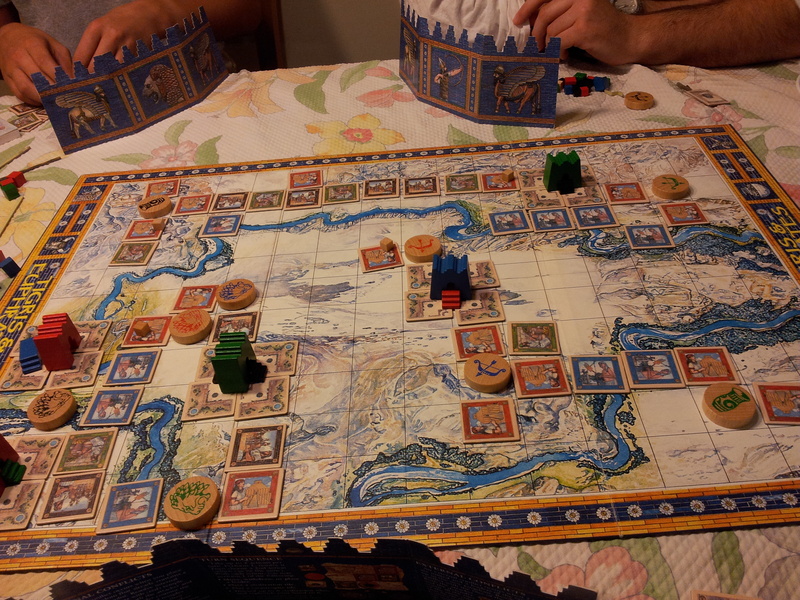 Jon: I taught Amerigo, Tigris and Euphrates, R-Eco to Eszter and some others, Lo Ra, and Antike, but didn’t play them (except for Lo Ra). Yahel, Avi BB, and Nati are all new attendees. Welcome! David came late, so we have to built from random cards instead of draft. I pulled 60 crappy cards for deck-buildings; even with a 40 card deck and playing with 3 colors, I still had to fill out my deck with a few useless cards just to reach the card counts. If I had some more time maybe I could have made a better deck with one of the other colors. I didn’t have any mana or color problems, but David built up a nice army and all I could do was throw things in the way until I couldn’t do that any more. Actually, I was able to ping him several times with a flyer while I was delaying his army – if I had a few good damage or game ending cards hidden in my deck I might have been able to kill him. Eventually I went down. First plays for Yahel, Avi BB, and Nati. Nati managed to avoid taking any cards until the end, which is great if you can keep control, but otherwise is often a recipe for death. First play for all, I think. Looks like it was a close game. First play for Nati and Yahel. I rarely get to play this gem. 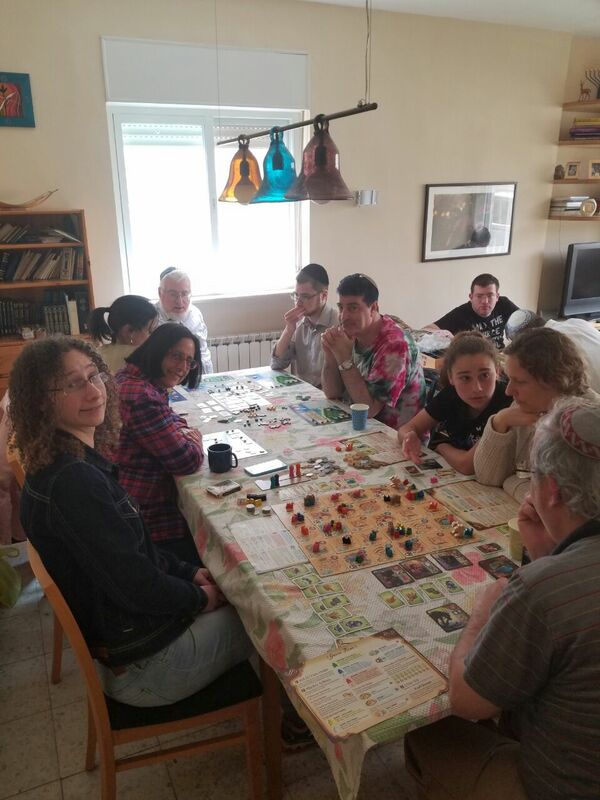 It took some time for Nati and Yahel to get up to wrap their heads around the rules, which is usual. They actually did quite well, especially at the start. 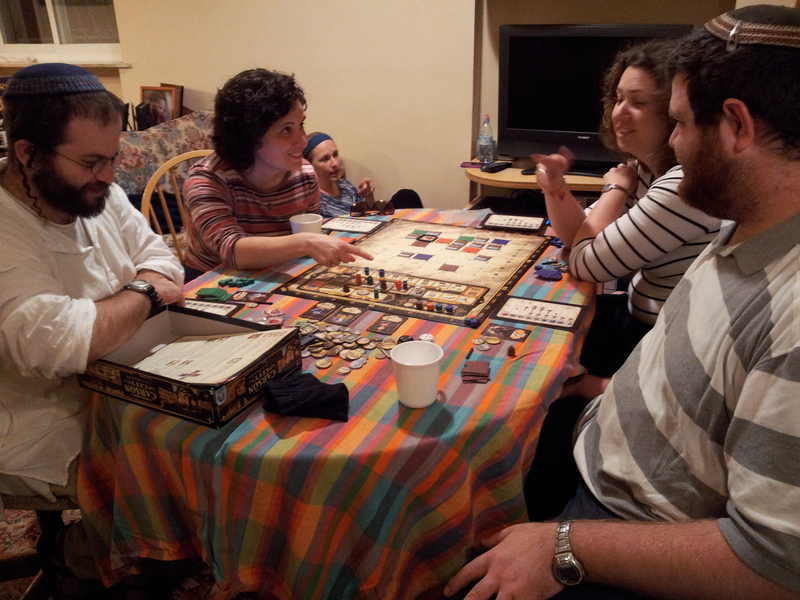 The first five treasures left the board fairly quickly. I built an easily conquerable monument just to show them how to do it, and then several more monuments went up. I won and lost some external conflicts, and found myself with all of my leaders off the board. I put them back down and attempted to end the game more quickly, which is what happened. I taught them this little game of mine, and we played several games. Nati won the first game with an astounding score of 1 – 0 – 0. Everyone won at least one game. They liked this a lot, too. 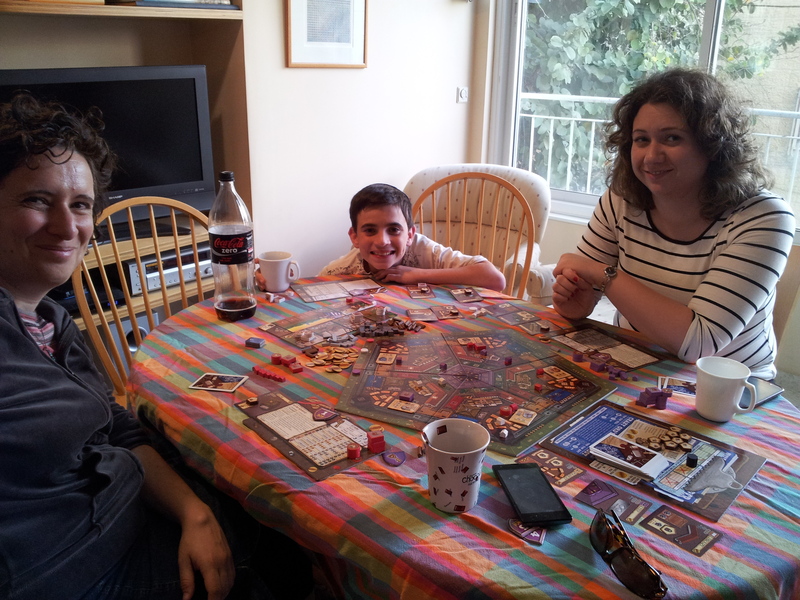 And I taught them this game, and they like it, too. We played the basic game. I didn’t see this, but this seems like a less close game (unless Gili got the scores wrong). First pay for Aaron. They played on the cheapest US locations. 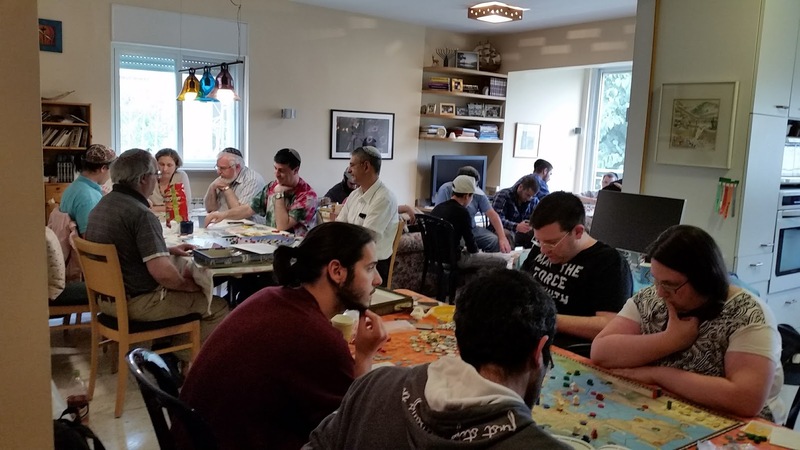 They played without our house rule, which made for some game chaos. Nevertheless, it seems that David had the game in hand by the last few rounds, at least. First game, no tichu; we had -5 points, they had 105. Second game I called and made grand tichu (with dragon, phoenix, ace, and two jacks); I passed him the dog. We had 220 to their 180. After the fourth game and two more tichus the score was them 405 to us 395. In one of these, David had a cross-bomb situation (4 card bomb crossing his straight card flush bomb). Fifth game they were up 480 to our 420. In the last round, Aaron called and made his first (?) tichu; I actually had a bomb and the dog to help him. 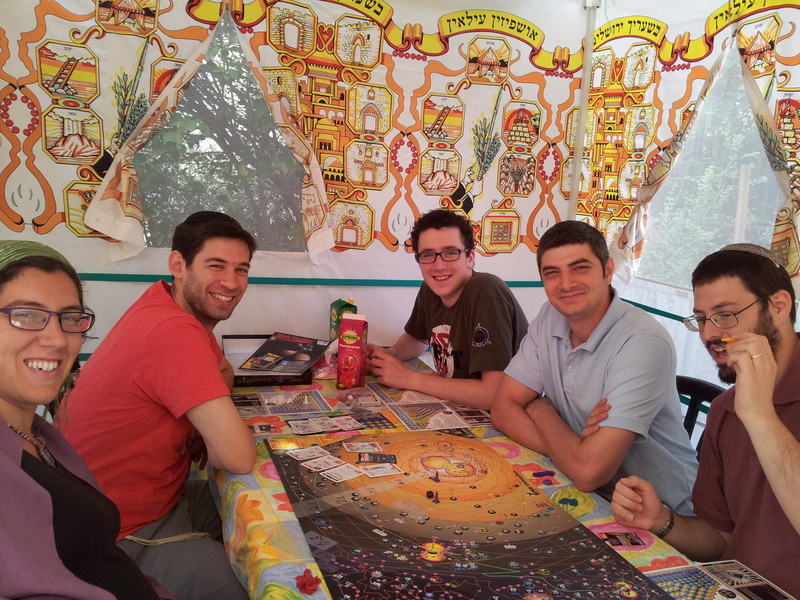 A great games day with our fun games day gang. Happy birthday to Bill, he left early to work before his roleplaying group meeting, Shirley came after work; they’re both still jetlagged from a week in China. Bon voyage to Mace who left early to catch a plane back to Australia. Emily and Eitan were sans Uli because Emily’s parents are handily visiting. The dinner order was complicated as usual with a lot of people, leading to Emily resigning from the next one – with honors for the excellent job she’s done. Thanks to everyone who helped with score reporting, organizing, and carrying chairs and moving furniture. First play for all except Jon. New to them; they liked it. Played at the end of the night. Jon had pretty bad cards overall. 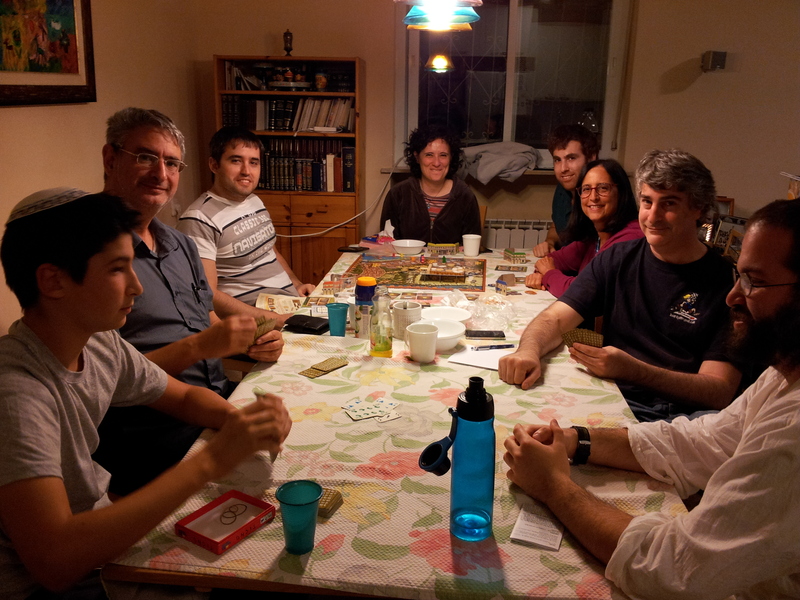 We played a fun, relaxed game without scoring and with discussion of bids, good practice. 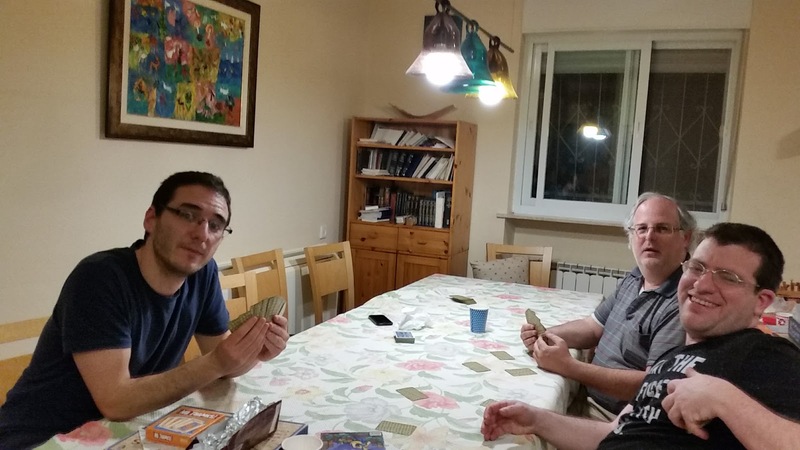 I was playing a hand, I was already set, and Jon asked ‘why are we still playing this?”, which I took to mean he was generally bored as usual. But he meant, ‘can’t you claim yet?”; I realized after that play that I could but hadn’t thought about it. Avi plays very well, he overbid once, I overbid also. Jon and David at first were either playing or bidding well, but not both on the same hand. New to all except Eszter. A crowded board set up with most of the mountains very close to the town. Played on the couch and floor at the end of the evening. Very close scores, a fun favorite. I don’t think I’ve ever played with 3. They all enjoyed playing tremendously, despite, or because of, the challenge of having to remember information about cards that you can’t see, and did very well. 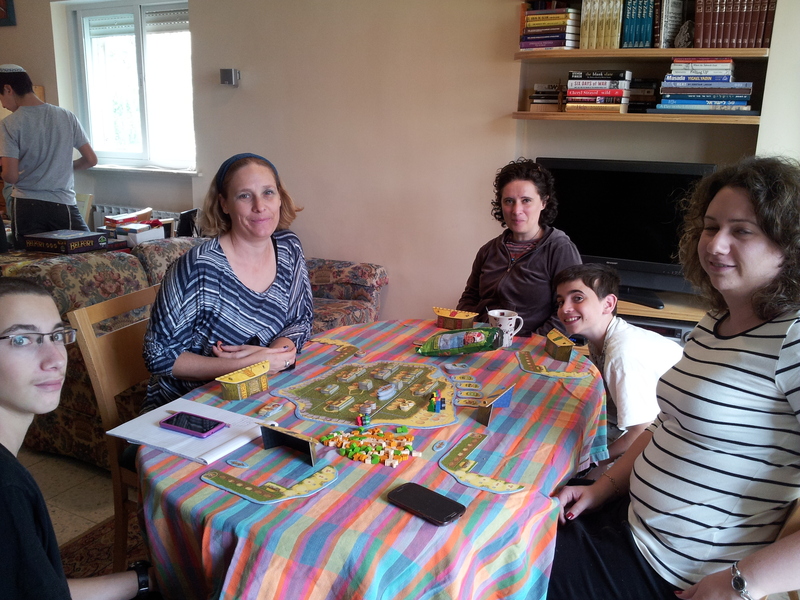 First play for Elisheva, Binyamin and Lotem. This was the entertainment for people who went to have lunch in the sukka. They all really sounded like rocket scientists, the game emulates thrust, oxygen etc in detail. Jon: Shirley won. David was a few points behind her and I was a few points behind him. I was ahead often in the game with 25 point quests, but the others were close behind with smaller quests and plot quests. And I only fed my lord 4 times for 16 points where they each ended with 32 points. I did better than usual. 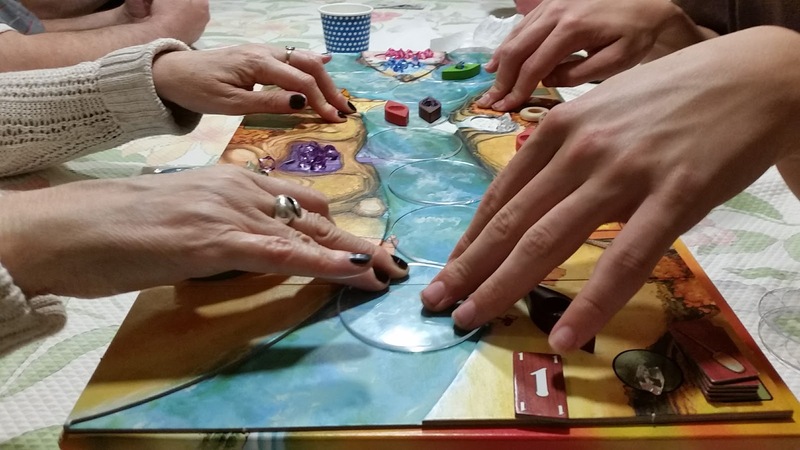 This game is fun with people who get it and enjoy the uncontrollable situations. 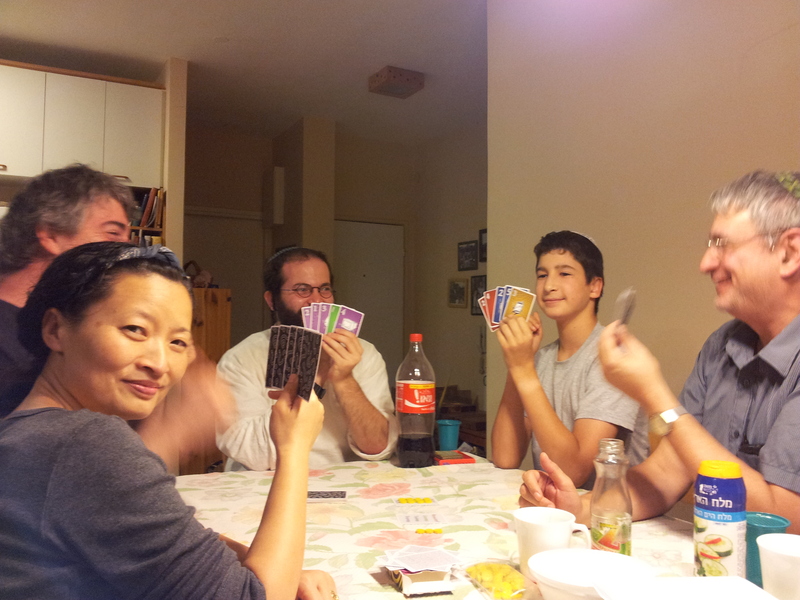 I lost when I had the countess and David the princess, next hand it was reversed. They think it’s funny how much information I don’t remember, and helped me eliminate available cards for guessing to speed things up. 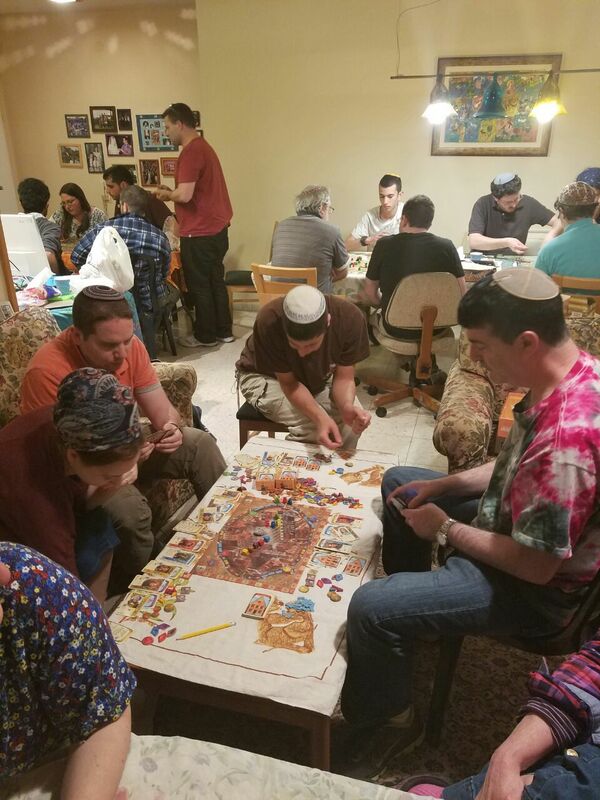 Shalom’s game with similarities to Settlers according to him. Apparently a very close win. I knew they drafted, but didn’t realize they then make up decks with half the cards. New to David and Avi. We had positive special cards – including extra money if you haven’t built yet. I didn’t do well at selecting cards. Bill would have reached 20 points right after David did. Jon played cards with negative effects on other players such as losing minions and cards, but Avi countered with one giving everyone a card. Easier with 3. New to Oran. He didn’t listen to the good advice David and I gave him, such as not buying so many intermediate power plants, and when to build. So he was right, very good play to beat both of us first time, and with his own strategy. We played regular, no card previews which changes the calculations. I was doing better than usual, I was in a good position throughout, and David was doing worse than usual, we don’t know why, but it was still fun to play, I haven’t played in at least a year. Jon: I taught him and he creamed me. New to Oran, who had a hard time finding them. 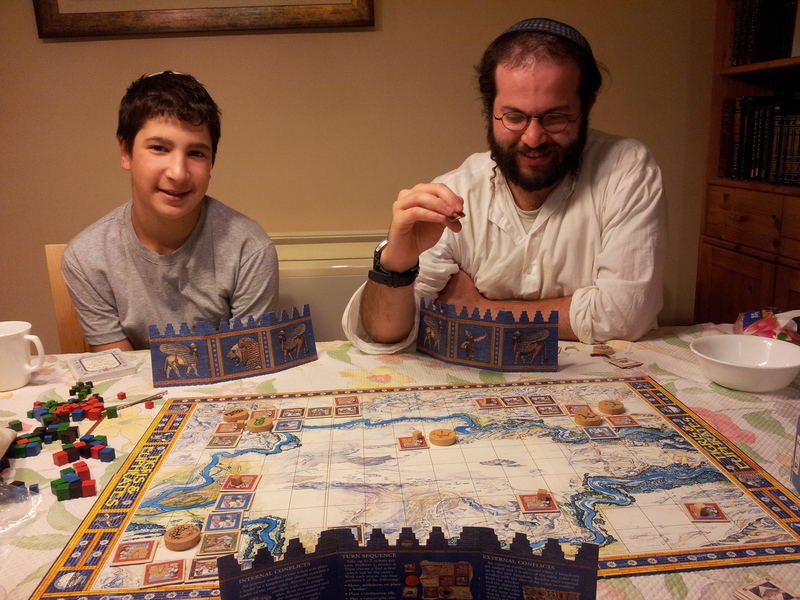 David gamely partnered with Avraham, completely new to the game. He understood how to play, but experience makes a different. 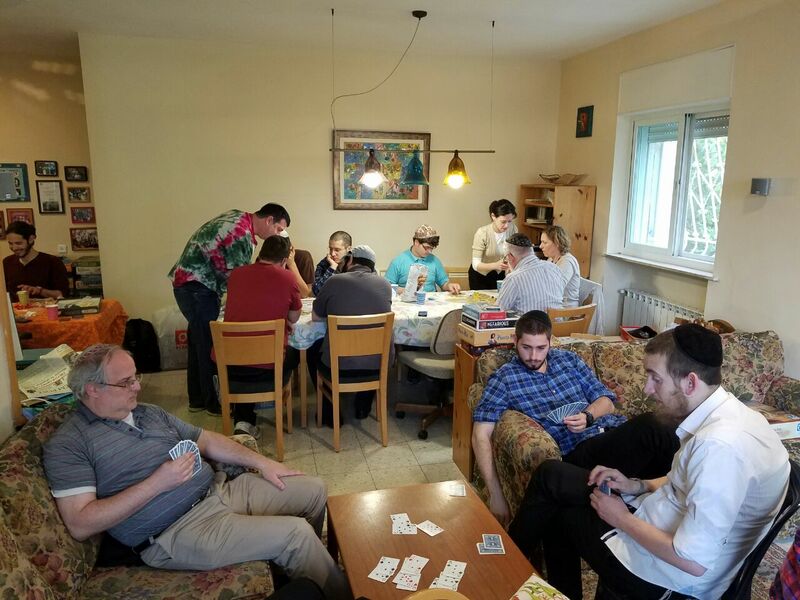 David and Avraham were ahead by a few hundred for a while, but Jon and Avi caught up, and won when they called Tichu and went out first and second; David made a mistake and forgot that Avi had only played one ace so there was still one out, Jon had it. David had 3 bombs in a row, wrecking one of Jon’s Tichus. I taught this to them, new to both. They did an excellent job catching on and built monuments, Avraham 2 and Avi 3. There wasn’t much conflict. I thought I was doing worse than I was. 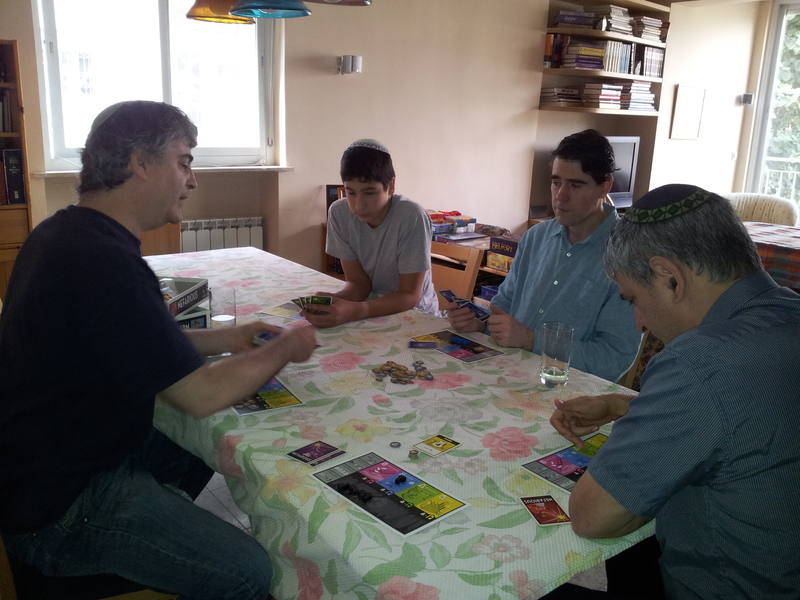 I think Avraham beat Avi because Avraham attacked more, he attacked me, but I didn’t play well. There is less conflict with 3 players. 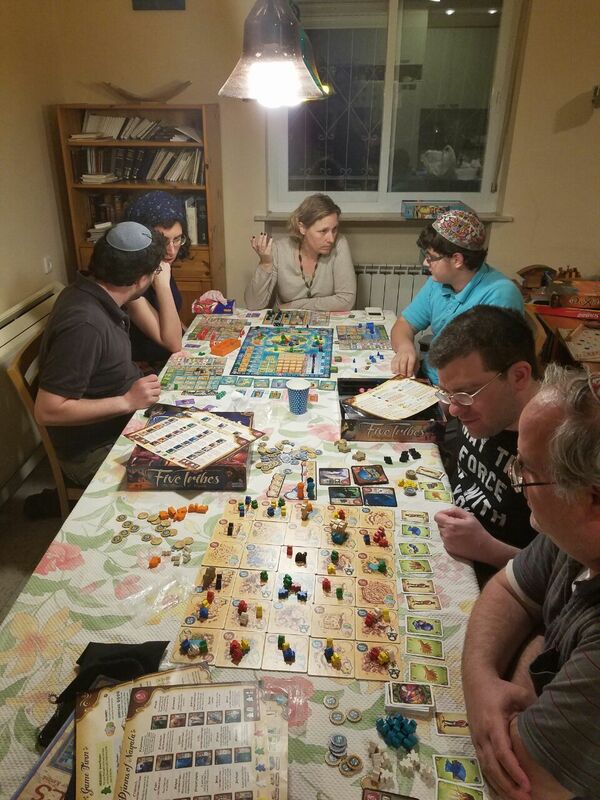 Ofer taught it to all of us, thought he hadn’t played before and needed to look up setup info, he didn’t have the rules in English, but he had read them online earlier. 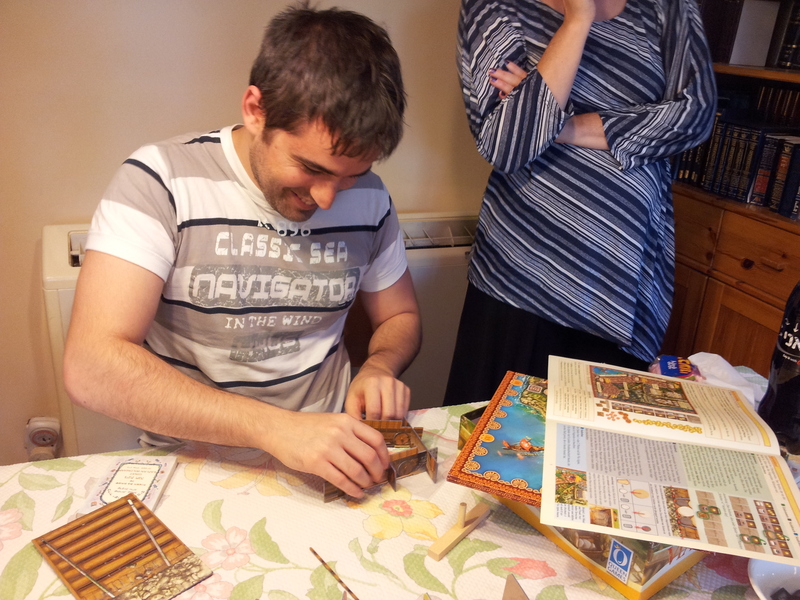 We punched out the game and Ofer managed to set up the main mechanism which releases disks with which to buy building stones. Near the end of the game, when one type of stone ran out, he discovered a new rule that you can get a coin instead of a stone – people who had tossed due to lack of storage took money for earlier moves, unbalancing the timing. 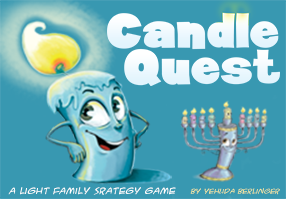 It’s a cute, light game, though Pushing and losing feels like luck; it is partly, but also related to when you select that action. 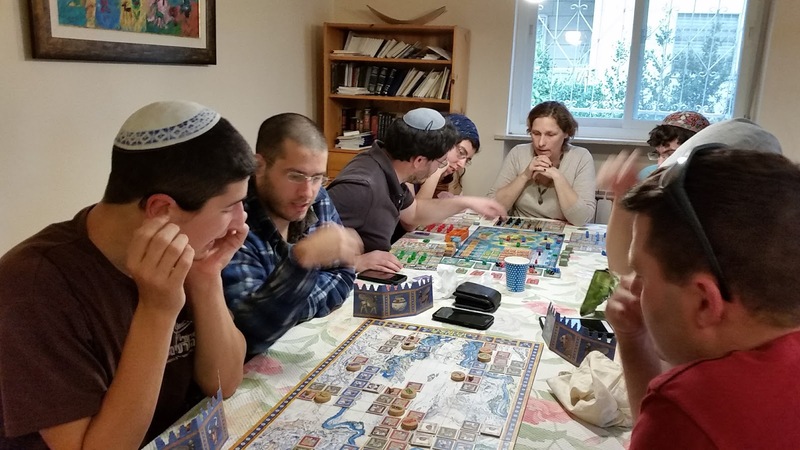 Eszter did really well with it, Ofer who was before her didn’t, he put them in position for her, as did I. I didn’t like that aspect, and often I couldn’t take full advantage of my actions, for example, only having one stone available to build instead of the two allowed. I focused on money for movement, but that’s not enough. 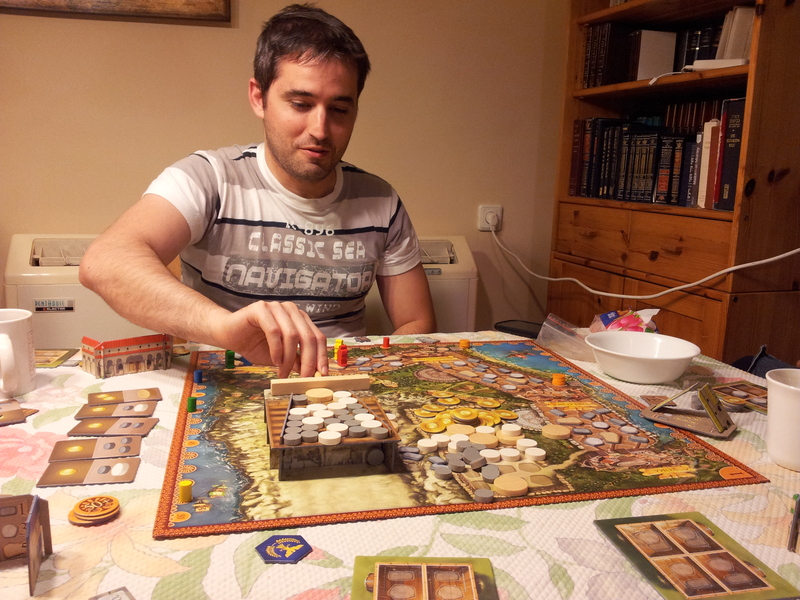 I also built, but Oran had a more successful strategy, he built mainly small stones, and got bonuses for it. New to Shachar and Avraham, and Mace has played around once. Everyone did well, and sold a lot and bought bonuses. Mace and I had similar strategies, storage and coins. He wanted to get both coin bonus tiles but I got one. On the last turn, I changed from buying a farmer for two points to selling for 3 coins with space for 2, because of my coin bonus, even though it meant paying a coin for food. A mistake, I got all zeros, and paying for food reduced the coin bonus to one extra, for a gain of one instead of two. If I had drawn better coins I would have tied or won, but it’s less likely to draw those at the end of the game. The keep two tile year came up first, when it’s less helpful, though it does increase production quickly. It’s an easy game to learn. Eszter wanted to play it later, but too many people who had already played it were available. Shachar had 3 bonuses and almost got another one. Mace and I would have had one more point if we had drawn tiles which close fences on the last round.